These were all the competitors in form; not all in the same division. 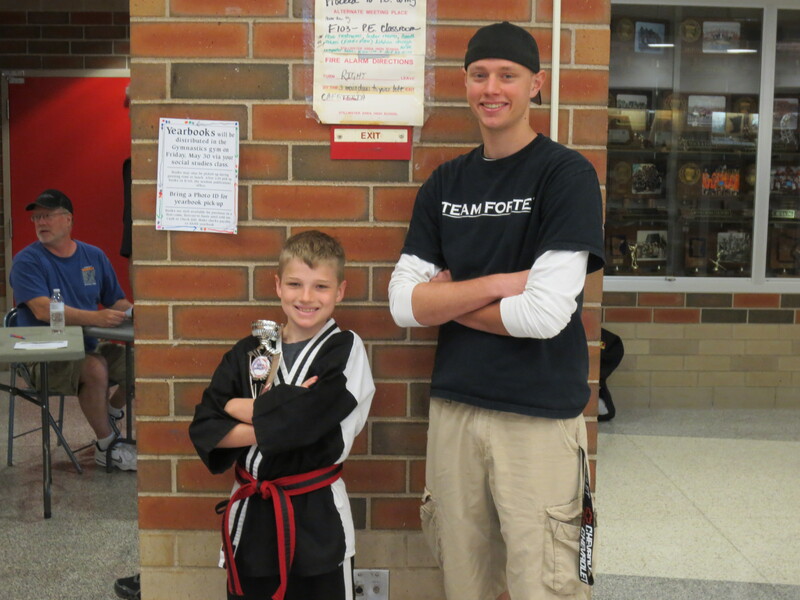 On June 1st, Michael had his first karate tournament as part of Team Forte. He hadn’t been on the team very long, and was very nervous about competing. Luckily, this was a very small tournament – a great way to start out. The tournament was very different from how I remember them being 20 or so years ago when I used to compete. I can’t pinpoint exactly how, but it wasn’t what I expected. The event was held at Stillwater High School. We walked into the school into a cafeteria, it was fairly dark, and very quiet. The attached gym was nice and bright though. 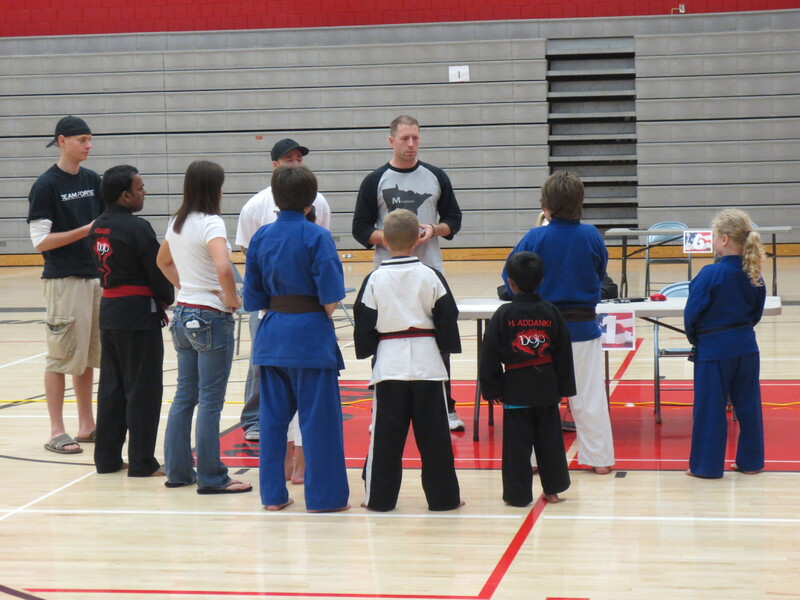 Right at the start, the rules were explained to all the competitors before they divided them into groups. 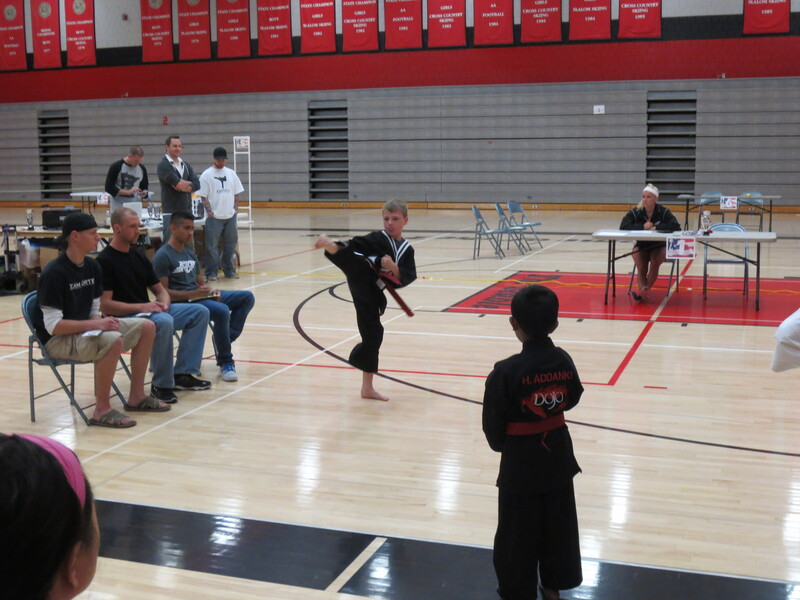 Two of Michael’s teachers were judges in his ring in the tournament. I thought that doing his form in front of familiar faces might help him relax a little, but it didn’t. Master Forte was there, but was not judging. He stood ring-side to cheer Michael and Daniel (the other Team Forte competitor) on. Before Michael’s turn to compete, teammate Daniel competed in an adjoining ring. Daniel has been on the Team for at least a year. He also competes dance (in fact, he is on Michael’s sister, Grace’s dance team). He was very comfortable in front of the judges. He took first place in his ring. When it was Michael’s turn, his nerves kicked in to high gear. He introduced himself, and proceeded with his form. He did an excellent job!! I was very proud of him! Where his nerves showed, was that his form was about twice as fast it should have been. I’m not really sure he breathed the entire time! Once he was done, he took a few deep breaths, and looked very upset. He told us he wasn’t happy with how he did. We were very proud of him, even if he was a little fast. He had the guts to go out there, compete, and get scored. In the end, he scored 4th place (out of 4). The first 3 places received a medal; fourth place got a trophy. Trophies are cooler, anyway!! After some congratulations, and pictures with different people who came to cheer him on, his sister and I left. Michael and his dad stayed to watch the competitors who were sparring later in the day. Since it was Michael’s first tournament, he opted to only compete in form. He seemed to enjoy watching team mates and his teachers spar. Who knows, he just may do both in the next tournament. Michael and Mr. Hallberg, his main teacher, and one of the ring judges. Previous StarQuest 2014 Next Picture This?